Caroline called me very late at night: "I can't do this anymore., - she claimed, - that's it!". I was half asleep. "What is going on...?" - I asked. "My life is a disaster!! My friend asked for help today, and I couldn't do it, - she whispered, - because I am too tired... "
I took a deep breath. "Caroline, - I said as calmly as I could, - you donated a five-figure sum to charity this year from the money you earned with your hard, devoted work, you went volunteering for a month, you help all your friends in spite of having a very demanding career! Just last Saturday you sacrificed your spa day to babysit your friend's child. Are you beating yourself up for saying no one time...?" She gasped. I felt that she is ready to cry. "You don't understand. - she said, - nothing of these is good enough!" "Will it ever be good enough...?" - I asked. She was silent for a while. "Is it that self-worth thing you told me about during our last session...?" I nodded, but haven't said anything. Caroline continued: "I get it, it is... is it possible to change it? I can't live like this anymore! I don't even know what I am without constantly doing something for someone!" One of the biggest challenges I see women face, no matter how successful or accomplished they are, is self-worth. Why do so many women struggle with self-worth? If we look at what we as women were learning when we were little girls, things become much more clear. No one ever explained to us what self-worth even is! We had to be good, kind, hard-working students, future wives, mothers... We rarely had to be girls who knew their worth. No matter what, right now it is our own (and only our own) responsibility to learn what it is to be a Woman Who Knows Her Worth. When I write this words, it reminds me of my grandmother. She was a very beautiful, strong woman. She went through the second world war. When she was 14, she was sent to the death camp and was magically saved because they transferred her to labor camp instead as she was young and could work a lot. She spent there more than a year. She rarely talked about that experiences, not because she was afraid of them... but because all her being was love. She talked about love instead. She told me how beautiful and unique I was. She cared about me being happy and playful. She read to me and played with me, took with her to work, had unlimited supplies of my favorite ice cream in the fridge and every month saved money for my future, even she didn't need to. How many amazing women like this do we know? Hundreds. It always admired me how they managed to keep their hearts open and care so deeply in spite of everything they went through. A woman's heart is still a miracle to me. Look into a woman's eyes. You rarely see her pain even if you know how hard her story might be. You see her attention, love, caring. You see power and strength you wish every woman knew about as we all have it. The question is how to find and open it inside. We have incredible opportunities to do it. We have access to information. My grandmother didn't have it, but if she would have, I can't imagine what hights she would have achieved. What life she would have lived. We can live this life now. Our mothers, grandmother, grand-grandmothers stand behind our backs, supporting us and giving us strength. Live. This is your time. Learn. Build. The life they couldn't imagine possible. The life every woman deserves. Before we go to the three practical steps to Your Worth, that already helped hundreds of women to raise their value, including Caroline, who practiced them with me and is enjoying feeling truly confident now, just a quick reminder that the S.P.I.R.I.T formula online program is open. If what I talk about resonates with you, promise me you learn how to understand your worth as a woman, it will radically change your life. If you're ready to do it, S.P.I.R.I.T formula online program was developed with this in mind and heart. Women have many amazing gifts and talents. Our physiology, hormone system give us advantages in realizing our best dreams. For example, historically women have developed right hemisphere. As the right brain is responsible for connection with the subconsciousness, we have a great talent to analyze many facts at once, making “right” decisions or “predicting” future. Deep connection with our subconscious mind, which has many hidden gifts, is what we call intuition. Generation by generation women developed their brain this way so that we can have a very sensitive and creative perception. Now it’s time to reveal these gifts modern women forgot about. Women are wired to give. Often it is very hard for us to say no or prioritize ourselves. We always unconsciously look for opportunities to help someone or lighten someone's mood. We can't pass the person who is upset. I believe the kind heart is the greatest gift. The greatest joy and the asset. But if you give your energy chaotically and don't focus it, you are left with lots of "thank you"s and not enough achievements, money, energy or appreciation that you deserve. One of my clients, Emma, was struggling because she did everything for everyone in her office. She was helping her colleagues with their professional or personal problems during lunch and often stayed late after work. Everyone loved her, but when it was time for promotion or a raise, there was always someone else who got it. She felt lots of resentment and anger. We sat down and took to pieces channels where she was directing her energy every day. There were more than 20. And they didn't have any common ground at all. We all do tons of small tasks every day, but if the common purpose unites them, then it's one channel. For example, you have 10 to do things on your list, but they're all connected and lead to finishing up the particular project at work or planning a kid's birthday party, consider it one channel. You don't try to organize 20 parties at once, but if you would, how far would you go...? Emma was merely spending her energy on too many things, so she didn't have significant results or someone who would support her in return. We worked on redirecting Emma's kindness in the way they will bring value not just to others, but to herself. Emma worked hard on setting boundaries and centering her energy. She did very well and got a raise in two months. Boundaries are critical. That's why we pay a lot of attention to it and practice simple, effective steps to become a master of boundaries in S.P.I.R.I.T formula online course. Women are wired to give. Most of us give a lot, help different people, never tried to assist a friend. We got exhausted. Especially when people start to take our help for granted. It happens because often we lose our balance in giving and receiving. The balance is essential. The same as giving, receiving is one of the gifts of female power. To live a balanced, happier and less anxious life we need to restore the balance between giving and receiving. Sometime after my grand mother's death, her wisdom kept reaching out to me. Her sister was telling me lots of stories as I was growing up and asked more questions. My grandma was incredibly generous. She loved giving presents, gathering people in her house, helping others. She was a woman of power and got what she wanted, but always used it for good. I asked once: "Why did my grandmother was so giving even in the hardest time...?" Her sister told me: "Because she knew how to receive first..." She told me how people helped their family of 7 kids, where their father was killed during the war, how my grandma was rescued from a death camp, how for many years she was neighbors with her best friend, who held her hand when she died. I would love to know if you had any great women who inspire you in your family? Remember, Everything you worry about can be easily solved. P.S. 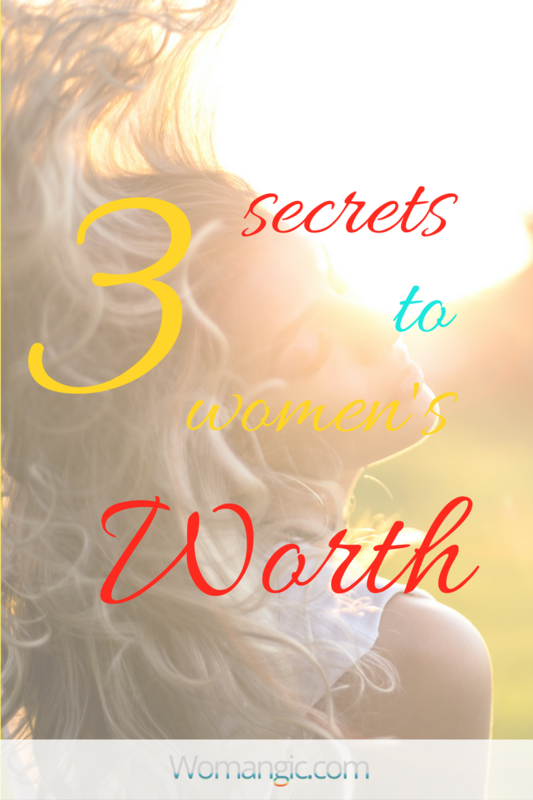 If you liked the article, you can learn even more principles of a woman's worth in S.P.I.R.I.T. Formula Program. S.P.I.R.I.T. 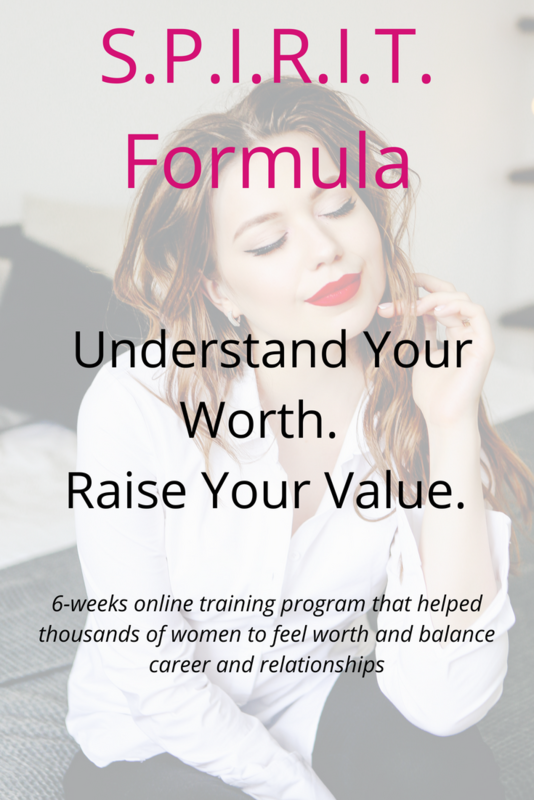 Formula helps you understand your worth, feel more appreciated, lighter and happier. A program that will open your eyes to your own worth and power, raise your value, forever changing the way you look at yourself, even the way you express yourself and how you expect to be treated. Guided by S.P.I.R.I.T. Formula you will realize your importance on the planet, experience more appreciation, feel peaceful and empowered, connect with your passionate side. S.P.I.R.I.T. Formula has almost a thousand happy students from more than 20 countries. You deserve to live a life you imagine, but how can you create it without knowing you worth it? As good as S.P.I.R.I.T. Formula is, it's nothing compared to what it could be for You. It's nothing compared with the future - your future - after you know Your Worth, and raise your value, the World responds to you with appreciation and enhanced possibilities you truly deserve.